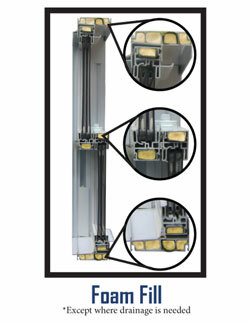 Lang Exterior vinyl windows are built for energy efficiency. Combined with energy efficient glass options like Low-E and Argon, foam-filled vinyl brings an added dimension of savings by reducing the amount of heat displacement through the vinyl itself. Lang's foam-fill process uses a unique low-density foam that has minimal expansion qualities, so there is no risk of bowing or breaking to the window (unlike our competitors). Lang Exterior can insert foam in every chamber of the vinyl where drainage is not needed. In one example, foam filled vinyl reduces U-value from .24 to .22, an 8% thermal improvement.